Readers alarmed at missing the prior sixteen annual Animation Show Of Shows should take a deep breath. 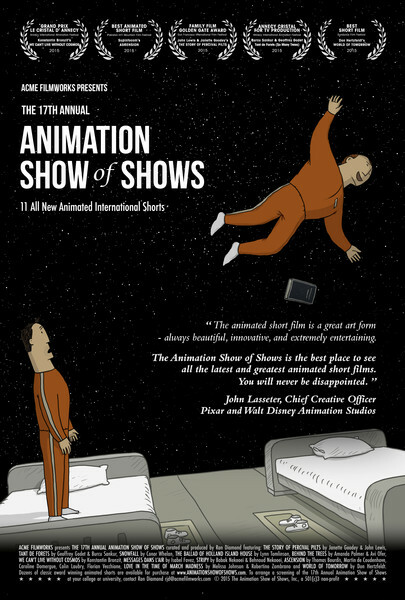 Unless you worked for such places as DreamWorks or Pixar, you had no way of seeing this annual collection of animated shorts selected from film festivals around the world. Now, thanks to a successful Kickstarter campaign, the general public will have an opportunity to theatrically view the eleven short films curator Ron Diamond selected for this year’s program. This opportunity should not be wasted. Janette Goodey and John Lewis kick things off with “The Story Of Percival Pilts.” It takes the premise of Italo Calvino’s “The Baron In the Trees” and tells its tale in Dr. Seuss’ manner. In the case of Goodey and Lewis’ tale, the titular character uses stilts to keep his lifetime vow of never setting foot on the ground. How people react to Pilts range from the entertainingly absurd to the hostile. By the end, an enigmatically wistful resolution takes place. It would be greatly surprising if Conor Whelan had never seen a Marc Chagall painting or two before creating his expressionistic short “Snowfall.” It’s a tale of loneliness and wisdom involving a lonely gay man who goes to a winter party and has an encounter that he hopes leads to something more. Whelan’s animation recalls Chagall’s floating figures to suggest desire. His use of animated space masterfully captures the protagonist’s emotional state. This is one of the show’s highlights. Lynn Tomlinson’s “Ballad Of Holland Island House” offers a nicely melancholy account of a house by the sea that’s served as shelter and witness to several generations of a fishing family. Its visual style captures the sense of an environment where lack of permanence is part of life’s cycle. Committing your partner’s nighttime mumblings to film seems like a recipe for divorce. Fortunately, since the filmmaker’s mumbling partner is noted fantasy author Neil Gaiman, musician Amanda Palmer can collaborate with Avi Ofer to produce the oddball short “Behind The Trees.” The film’s visuals take their cue from the conversation Palmer recorded with a half-asleep Gaiman. The resulting images manage to be both entertainingly semi-lucid and semi-enigmatic. One of this year’s touching must-see shorts is Russian entry “We Can’t Live Without Cosmos” from Konstantin Bronzit. 1203 and 1204 are two astronaut trainees hoping to make the cut for a space launch. But in the aftermath of a tragedy, how can the survivor continue to go on? Bronzit provides plenty of material for the viewer to understand the relationship between the two men. Whether it’s a favorite shared book or personal photographs, the viewer can appreciate the depths of the surviving character’s loss. Some viewers may cry foul at the film’s quasi-mystical resolution. Yet the mystery suggested by what happened feels appropriate for the cosmos it celebrates. Isabel Favez’ “Messages Dans L’Air” uses cleverly folded animated paper in a story about a boxer, a neighbor woman, and the exasperating mischief-making cat that brings them together. Far more outrageous comedy comes from the wonderful Iranian short “Stripy.” A homage to classic 2-D animation from Babak Nekooei and Behnoud Nekooei, it’s the story of a painter who tires of his mind-numbing job of repeatedly painting three straight stripes on the boxes that pass before him on an assembly line. When the painter asserts some creative individuality via swirls, his defiant action has far reaching effects. The Nekooeis’ hilarious images match the pacing and rhythms of the short’s Johannes Brahms’ “Hungarian Dance No. 5” soundtrack. There’s even a nice final joke to match the Brahms piece’s end. “Ascension” from (deep breath) Thomas Bourdis, Martin de Coudenhove, Caroline Domergue, Colin Laubry, and Florian Vecchione offers a computer-animated tale of a semi-Sisyphean task. Two men attempt to place a metallic Virgin Mary statue on a mountain peak. Unfortunately artificial limbs and an unwelcome avian visitor turn the job into a headache. Providing a nice visual and emotional contrast to “Ascension” is Melissa Johnson and animator Robertino Zambrano’s moving “Love In A Time Of March Madness.” Instead of going for detailed realism, Johnson and Zambrano’s piece uses frequently melting images to capture the emotional elusiveness of successfully relating to people. The short adapts Johnson’s autobiographical Salon essay about the difficulties of finding love when you’re a foot taller than the average woman. Johnson, who also narrates the film, recalls rueful and wince-inducing encounters with eye-rolling pickup lines and self-involved hurtful commentary. Fortunately, the narrator finds a way to transcend her situation. Veteran animator Don Hertzfeldt closes the Show of Shows out with his hilariously cynical “World of Tomorrow.” Very young Emily gets visited by her far future clone. The time travel visit allows the clone to tell the child of such future wonders as the Outernet and commercial accessing of memories. But it soon becomes clear that the passage of centuries has not eliminated such problems as class differences and looking for love in the wrong places. Like “Snowpiercer’’s critics, scientific pedants will question the scientific plausibility of Hertzfeldt’s vision. For everyone else, Hertzfeldt’s satirical tale is an emotionally accurate must-see. Following four of the shorts, the shorts’ animators talk about the backstories behind their works. Interview subjects are Whelan, Bronzit, both Nekooeis, and Johnson. These choices are much appreciated, as those animators’ shorts were among this Show of Shows’ strongest offerings. Having Hertzfeldt talk about his closing short might have been enjoyable, if there wasn’t the possibility that the animator’s dark vision might leave the viewer depressed for days.